You know about drones and their utility, right? The drones are the most amazing inventions in technology, and they can make your life easier, even in fishing. You might have already guessed that drone fishing is nothing but fishing with a drone. However, drone fishing is a lot more than just fishing. 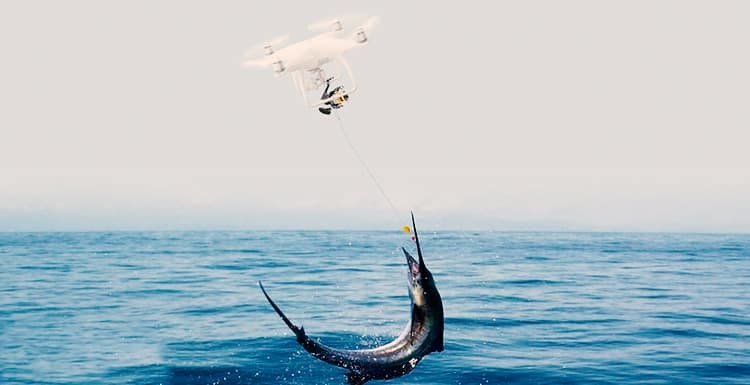 Drone fishing is the newest and the most exciting fishing style that utilizes the advanced technology of drones to allow you to do the things which you have always dreamed of doing while fishing. For both professional and recreational anglers, and those who fish with a boat on the coast, drone fishing can open a new world of fishing possibilities for you with endless opportunities! You probably have already watched the video published a couple of years ago that shows a couple of anglers catching longtail tuna with the help of a drone. The drone placed their baits 400 yards off the beach in New South Wales, Australia and they caught their desired fish. This video went viral at that time. In fact, that video has shown just one of the many possibilities that you can achieve in fishing using a drone. To put it simply, drone fishing is catching fish with the help of a drone. You can take a lot of help from a drone while you are fishing. Mid-price drones can hold baits on the surface, and they can also provide the resistance you need to release a kite clip. The built-in camera of the drones can provide you with spectacular fishing photography. On top of that, the overhead view and territory-covering ability of the drones are perfect for locating the fishes, scrutinizing the topography, and exploring the implications of fish behavior. Drone fishing opens these possibilities for you whether you are fishing from the coast or you are fishing on a boat. Besides the techniques and methods you use to find the fish, a drone can offer you a few more technological advantages. You might use a fish finder, but it will only provide you the scenario of the specific area of water you are on. You will also need a boat for using a fishfinder. However, with a fishing drone, you can see a lot more than that, and you can cover a larger area also. The drone’s camera will allow you to inspect the water before flying out the actual bait. You can note down the potential spots of fishes from shore and use the GPS location system to drop the bait later. A fishing drone gives you the bird’s eye view of the area you want to fish. For long distance casting out into the surf, you always needed a kayak. Now, you have a much better alternative. You don’t need a kayak and ride it yourself. A drone can do this job for you much faster and more efficiently than the kayak. The price of kayaks and fishing drones are also similar. You can use a drone in any kind of surf condition, but you cannot always use a boat. You also don’t need a truck or trailer to transport a drone to your desired fishing spot while you will need that with a boat. Drone fishing for tuna is much easier and effective while using a boat for fishing tuna can be difficult and sometimes frustrating. There are also a lot of limitations of drone fishing mostly because drones are not cheap. The rules and regulations for using the drones increase its limitations. When you are not using a boat, and you are only using your drone for fishing, you will always be at the risk of losing your drone forever. The drone might cause dysfunction on the water, and you might never find it. The battery of life drone is very short. It won’t last more than 20 minutes. So, you cannot fly out a drone for over 20 minutes. You might have to buy some extra batteries to fish for a long period. As drone fishing is a new phenomenon, it might create a lot of attention among the people. Creating attention is never good for fishing. It might distract you a lot. Drones cannot carry the baits that are large and heavy. So, if you want to catch the bigger fish, you might not use a drone for that. You also need to register your drone that is over 0.55 lbs. (250 grams) of weight from the FAA. The registration fee is $5 for three The drones that are less than 0.55 lbs. do not need registration. However, you cannot use such a small drone for fishing because it won’t be able to hold the weight of the bait or the line. Although there are some limitations of the fishing drones, the benefits and the possibilities of drone fishing are undoubtedly endless. If the cost is not a concern for you, a drone is a must needed gear for you to better your fishing experience. A fishing drone can also be a great way of observing the natural beauty of the ocean, sea, or the rivers with a great bird’s eye view.